At my husband’s Christmas party a few weeks ago, they had a delicious Moroccan Chicken dish. I loved the sweet heat and warm earthy spices that I just had to try it on my own. 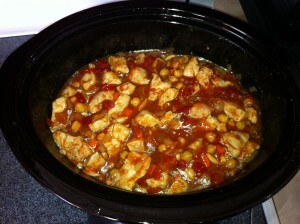 After a little grocery shopping for a few spices, I decided that today was the day to make this hearty dish. Tagines in Moroccan cuisine are slow-cooked stews braised at low temperatures, resulting in tender meat with aromatic vegetables and sauce. Since tagines are usually cooked in earthenware over low heat for a long period of time, a slow cooker is a fair replacement for the cooking vessel however, it leads to a few more steps in the cooking process, such as browning the meat first and building the sauce before adding it to the pot. 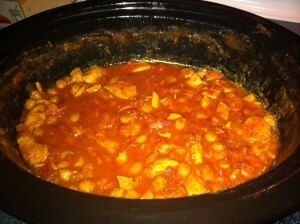 Add the chickpeas, carrots, almonds, and apricots into the crock of the slow cooker. Add a drizzle of olive oil and warm up your skillet. Once hot, cook the chicken for a few seconds per side, just to get a little color on it. 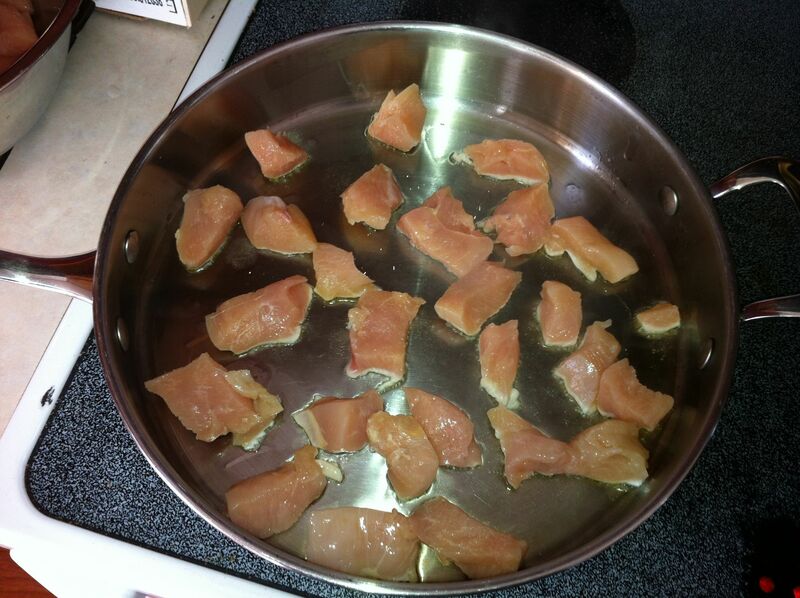 As you take the chicken out of the pan, add it to the slow cooker. Next, drizzle in a little more oil, and sweat the onions and garlic. Once the onions are soft, stir in the corn starch. Make sure to incorporate thoroughly to avoid lumps. Deglaze the pan with the chicken broth. Add all of the spices to the pan. Stir to combine. 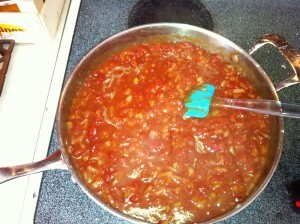 Add the ginger, tinned tomatoes & their juice, the tomato paste, and the honey. 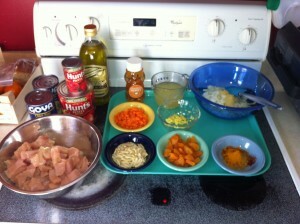 Once it has all been incorporated, add it to the slow cooker. Cook on high for 4 hours or low for up to 8. Stir it every so often to make sure that everything is incorporated and that the apricots are in the sauce (you want them to absorb the liquid and get plump). Serve with couscous or rice, and flat bread.